Non proprietary battery support. 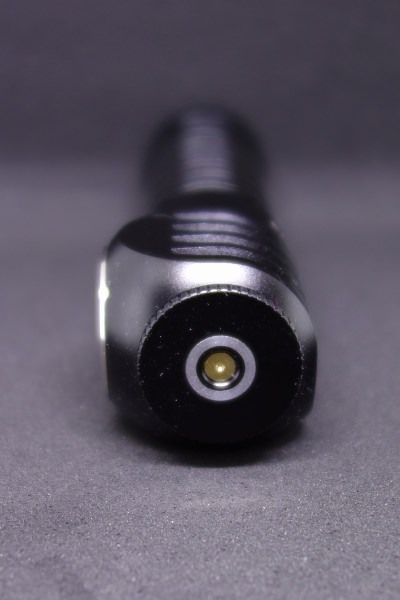 Any 18650 LiIon battery, protected or unprotected, button-top or flat-top can be used. 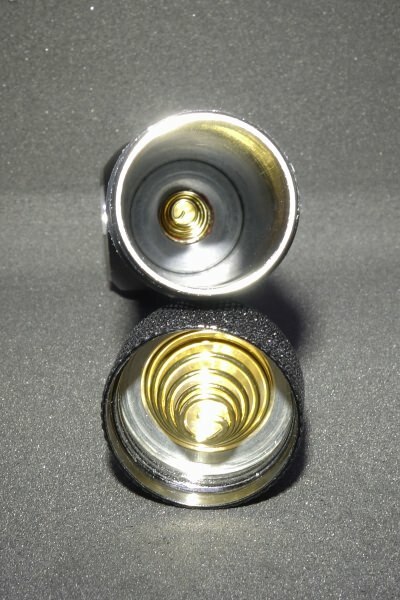 ^^ however, I do not recommend using battery with proprietary positive and negative contact point at the same side as the contact spring might risk creating a short. The model name is printed at the tailcap. although an usual design choice, it still works but with a caveat. The Turbo mode does delivers close to 1000 lumens in my home-made lightbox. 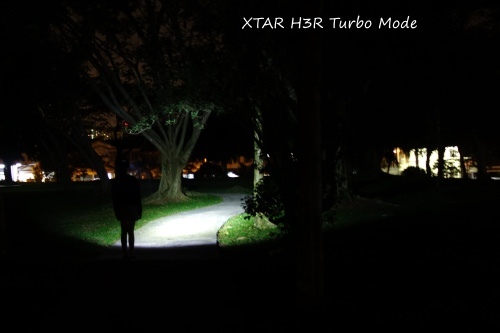 The manual says H3R will step-down to 60% brightness after 3 minutes on Turbo, but I'm glad and pleasantly surprise that it doesn't work/follow what was written in the manual. LOL! The build quality is consider above average. The anodizing is most definitely not up to HA standard (yeah, called me spoilt child of the SureFire HA finishes, I don't mind). Modes switching is stable via the side switch. 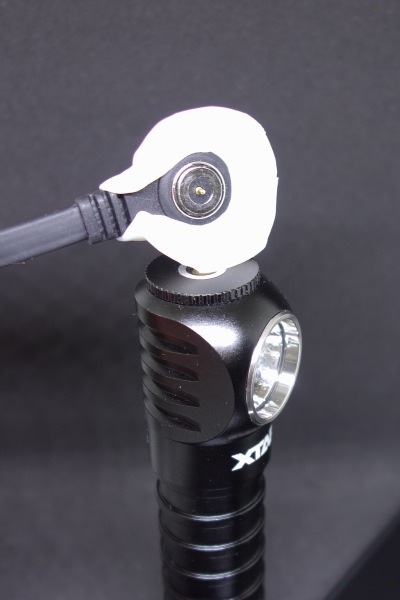 However, when using together with the included headband, I found that the side switch gets in the way of rotating the headlamp as the only usable way to rotate is by grabbing the H3R by the head when rotating because if you grab it by the tail-end, the tailcap is easily loosen. This is a design shortcoming in my opinion. I'm puzzle by the decision to memorize the Turbo mode when we can just double click in any mode to go straight to Turbo mode. It would be better to leave the Turbo mode out of the memory group in my opinion. 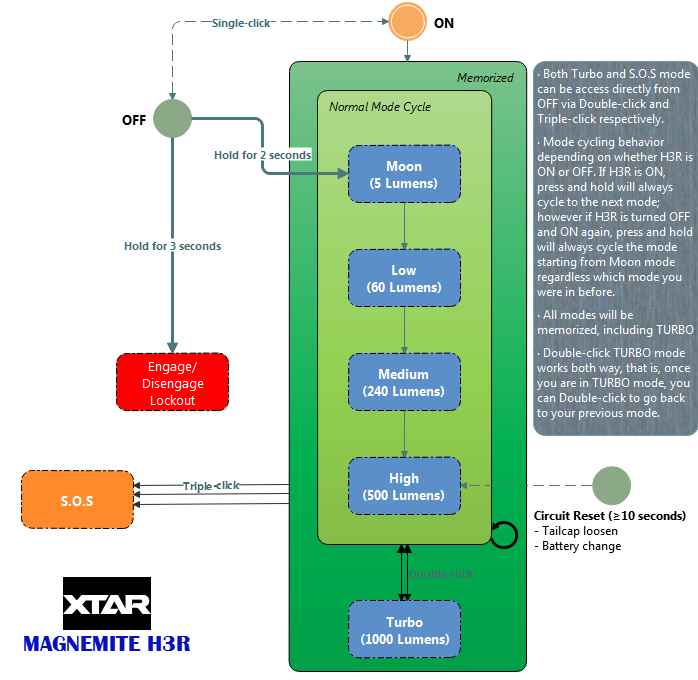 The circuit reset will defaults to High mode upon turning on the headlamp after 10 seconds or more of open circuit (meaning no battery power provided). 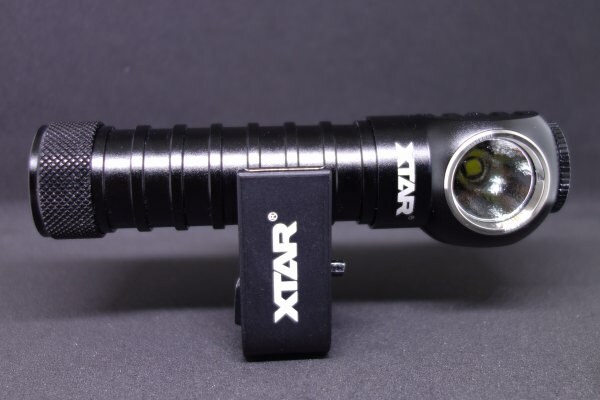 With the push to provide flashlight and headlamp with recharging function, it is no surprise that XTAR has join the latest craze. However, with all the rush to push the product out the door, very few has manage to pull it off safely with fast charging. 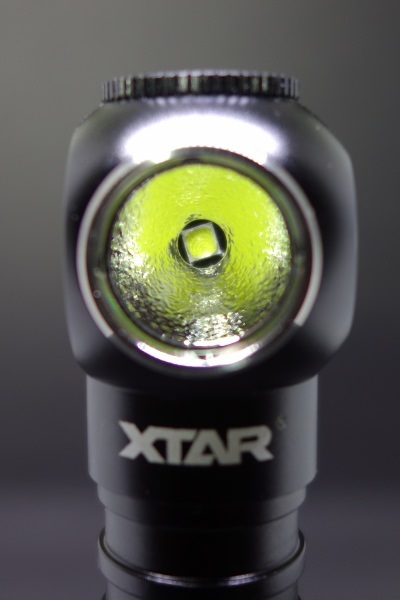 Given XTAR track record with huge line-up of LiIon and NiMH charger, it's no surprise that XTAR is among the first few that provided 1A fast recharging via USB. However, I was shock at the compromises made for the USB recharging cable. Now, H3R by itself is quite safe as I cannot detect any live Voltage nor current readings from the expose charging contact at the H3R head. But the USB charging cable is what I would call an electric hazard. 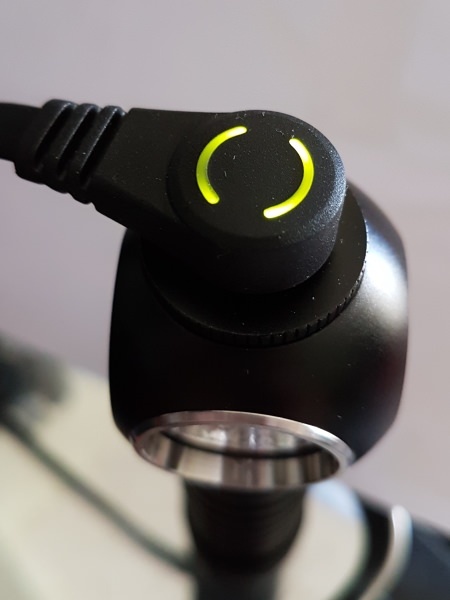 There are live Voltage and ~1A current running through the USB cable contacts, it triggers the short-circuit protection mechanism of my USB charging station and powerbank when the USB cable contacts are shorted. I can't believe how easy and frequent this happens and this worries me lot. 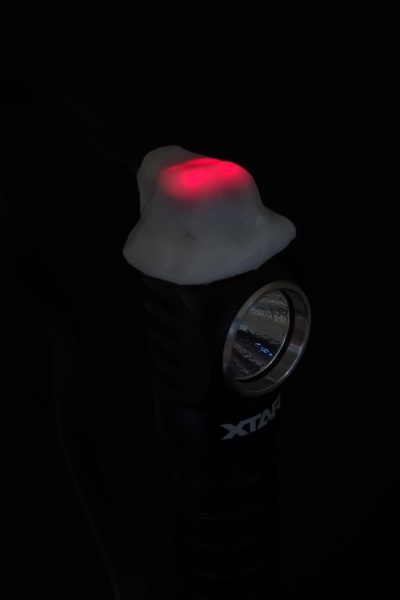 I have also tested with a USB power adapter without short-circuit protection, it allows ~1A current to run through constantly when shorted... needless to say, it easily lights up some steel wool too. 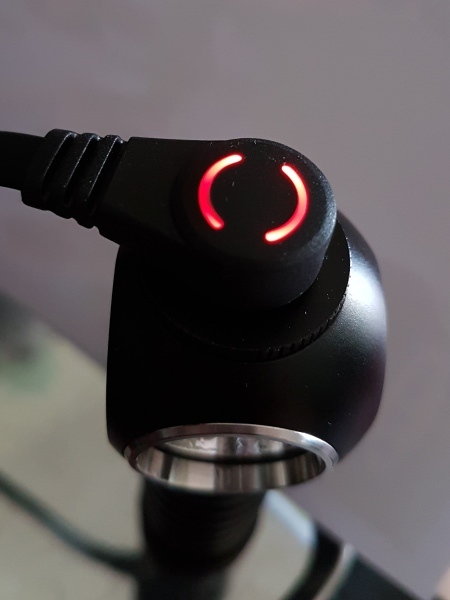 The magnet at the head charging contacts is good only for "attracting" the USB charging cable contacts. 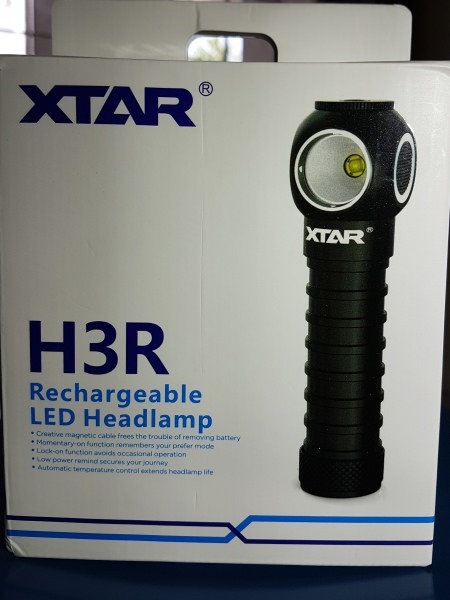 Don't expect to be able to use the headlamp horizontally while attaching it magnetically to ferrous metal surface because the weak magnetic strength cannot support the weight of XTAR H3R together with battery. 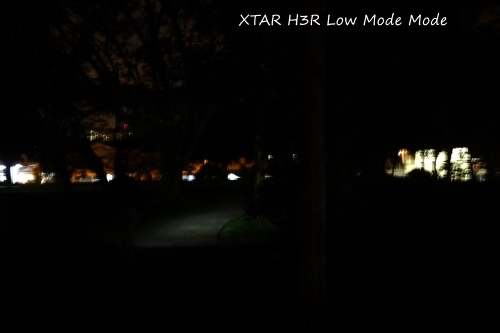 With XTAR 18650 3500mAH battery, I manage to get the Turbo mode to run for over 5 minutes before stepping down to ~80% of its initial brightness, and subsequently another drop to ~60% brightness at slightly over 10 minutes. 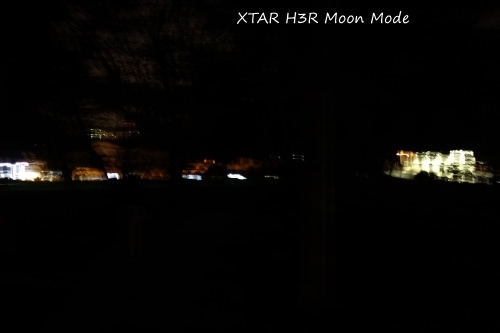 H3R then continue to run at this brightness for ~1.7 hours before it sees another drop and it continues to step-down afterwards. After ~2.5 hours of runtime, it finally drops below 10% of its initial brightness. 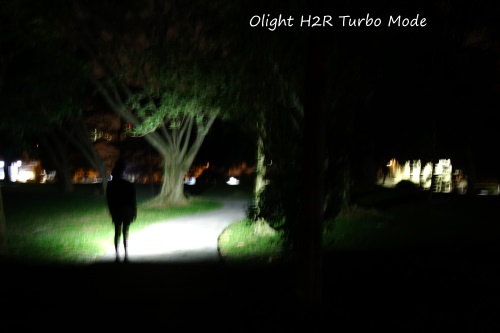 I think this is a much better runtime behavior than other similar flashlight/headlamp where there is only a minute or two of extreme output (accompanying with scorching heat) before dropping to a more manageable output to sustain the runtime. 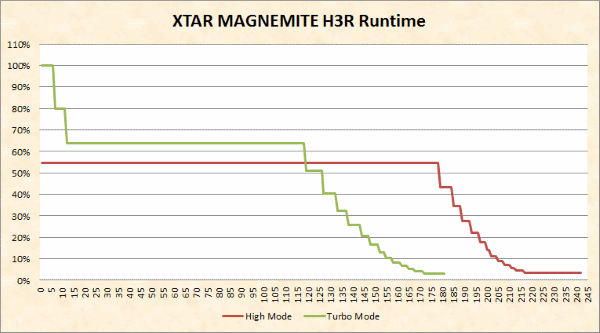 But don't get me wrong, this H3R at Turbo mode do run hot at its Turbo too, it's just not scorching hot. 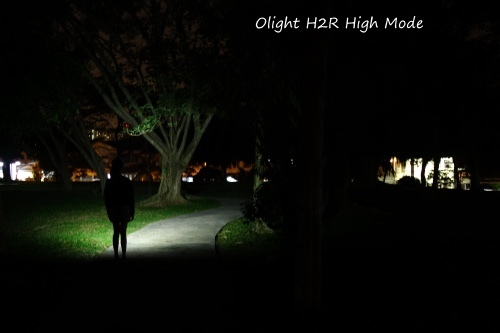 The above measured lumens are by no means authoritative nor an indication of over-stating the output by manufacturer. It's calibrated against some known output lights (e.g. Fenix, SureFire) so take it with a grain of salt and just as a relative reading. XTAR Magnemite H3R is a headlamp with so much potentials to be great... a 3 stars headlamp for now, hopefully they would incorporate more safety features in the recharging setup and make small changes to the Turbo memory mode (that is, don't put Turbo in memory). A circuit reset (battery change/replace condition) to Low or Medium mode is also a welcome change. 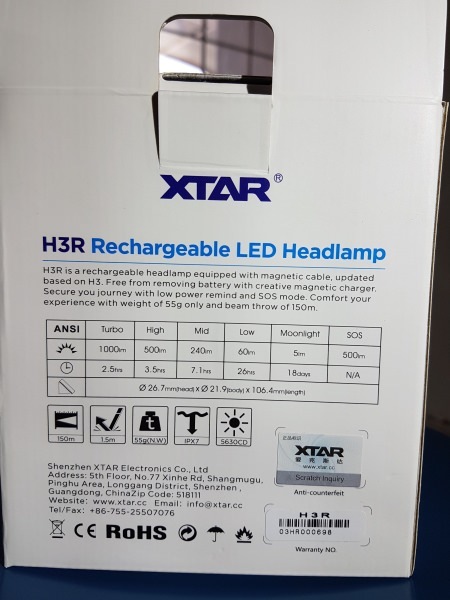 Is this a headlamp that I would recommend? Well, that depends on whether you can get a good deal on it or not (e.g. a free 18650 3500mAH battery included). The H3R headlamp is by itself pretty good discounting the hazardous USB recharging cable. 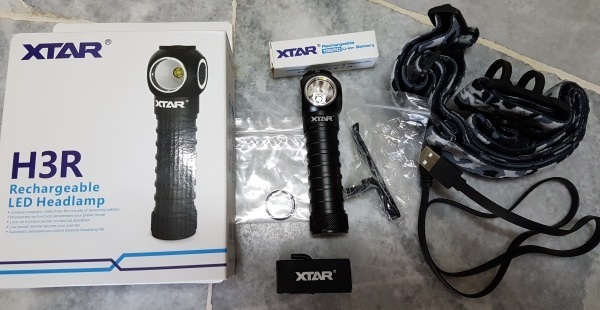 So if you are getting this headlamp, I highly recommend that you use your external charger and ditch the USB recharging cable and reserved it for only emergency use if and when you absolutely needed it. 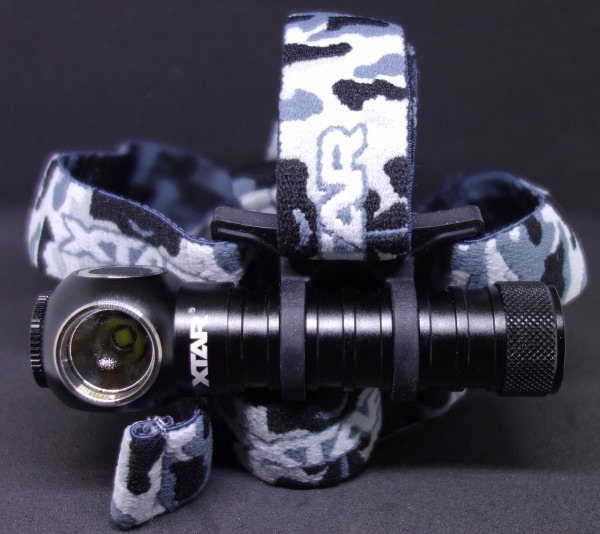 where can you buy this headlamp? Thanks for the review. Guess I wont be getting this headlamp. 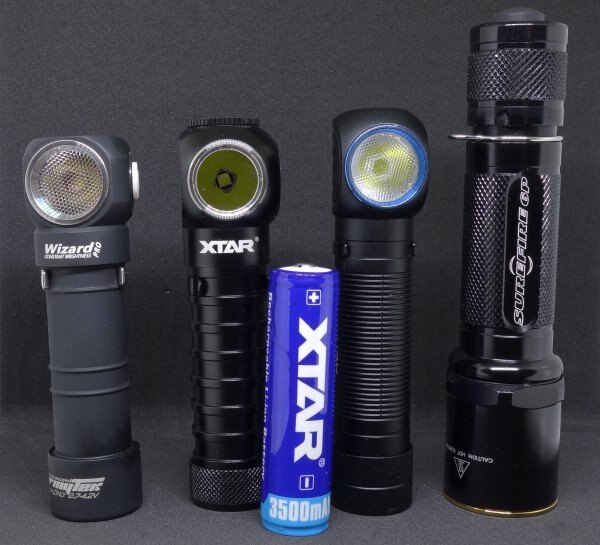 I just ordered an Acebeam H15 NW. Can’t wait to test it out. I have one that is some months old. After some time I wanted to use it, but no light even after some hours “charging”. I thought that the battery was broken, so I bought a new one. But still it is not charging. There is noe red light in contact, and when I disconnect there is no light. 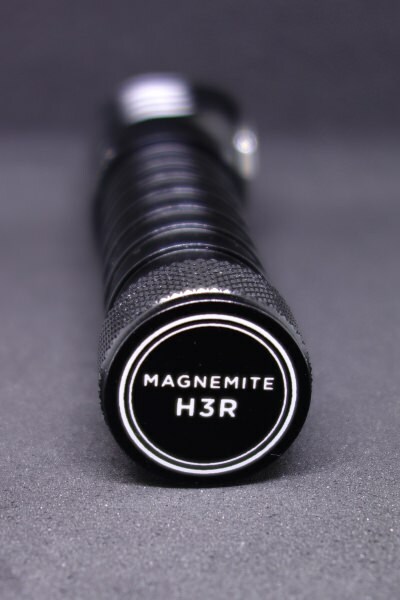 However the voltage of the battery is more than 3.4 V, and there should be light without any charger connected. Obviously to me there must be something wrong with the system. The lamp is ok, because it lights up with charger connected. I would not buy an external charger before I am sure the head light is ok.